A bright blue bus is making its way around the Columbus campus of The Ohio State University. The bus is more than a way for students to get around campus; it’s a research platform that could lead to a cleaner campus of the future. Friday was the first trip around campus for a new hydrogen fuel cell bus. It’s part of the Campus Area Bus System fleet and is on loan from the Stark Area Regional Transit Authority for one year. Ohio State President Michael V. Drake was one of the first passengers on the bus. He joined students, campus researchers and members of SARTA on the trip. Hydrogen fuel cells essentially convert hydrogen into energy to power the bus. The exhaust of the bus is water – as opposed to greenhouse gases. Jim Durand, research associate at Ohio State’s Center for Automotive Research, said hydrogen fuel cells can be recharged quickly and can run all day. CAR has installed a hydrogen fueling station at its Kinnear Road location. Drake said the fuel cell technology is one way for the university to meet its ambitious sustainability goals. Among those is Ohio State’s goal to achieve carbon neutrality by 2050. The bus serves a research purpose as well. 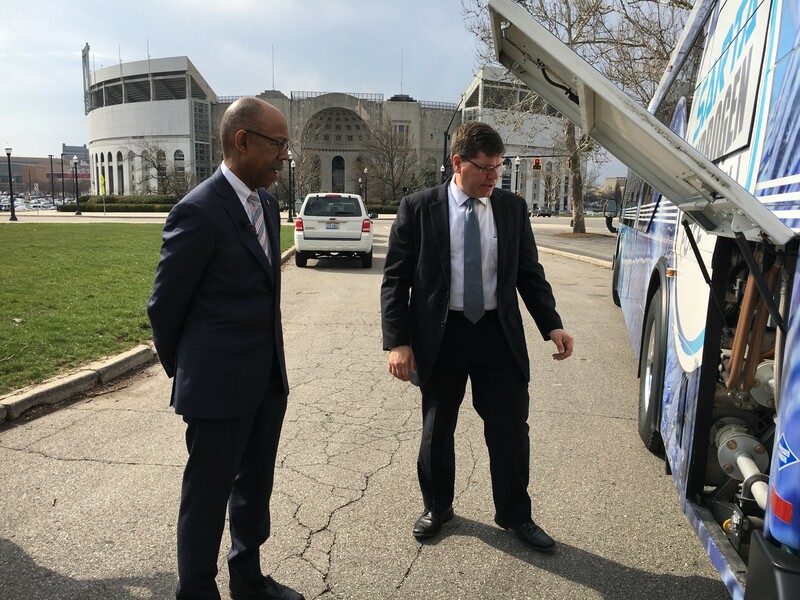 CAR researchers are collecting data on the bus’s performance at Ohio State to share with interested scientists. “We’re trying to take this technology and help the commercialization and ultimately improving this technology and deploying it in the state of Ohio,” SARTA CEO Kirt Conrad said. That transportation research fits with the university’s role as the lead research partner on the Smart Cities initiative. Last summer, Columbus won the U.S. Department of Transportation’s Smart City Challenge. The win secured $40 million in grants from the federal government and another $10 million from venture capital firm Vulcan to develop and test high-tech transportation solutions. “The fact that the university is engaged in this kind of work is illustrative of why they are such a powerful partner for the city in our Smart Cities work,” Columbus City Council member Elizabeth Brown said. So more than just a strange blue bus on campus, it’s one piece of a long-term effort to help people get around in a cleaner and more efficient way. “As we think about our future and doing the best we can to help people be mobile in the 21st century, this is one of the best ways we can take the next step forward,” Drake said.